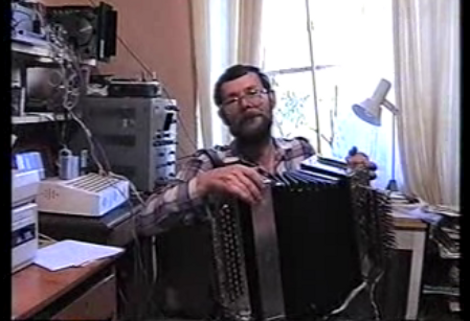 The year is 1988, where a Russian engineer [Vladimir Demin] has combined a Bayan, or button accordion, with several (we lost count at about 96) solenoids. If that alone doesn’t blow your mind the computer, also hand built by [Vladimir], controls the whole process leaving the operator to only work the bellows. Putting truth to the fact in Soviet Russia, accordion plays you. We wish we could find some more information about the instrument, but curse our inability to read Russian. Alas check after the break for a shorter version of the video in the link above. Related: Electronic accordion doesn’t compare. Those crafty Russians know how to have fun. 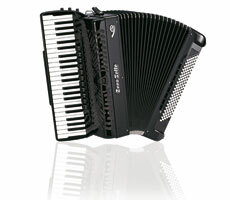 The instrument is called – accordion. This is probably the greatest “hack” I’ve ever seen on this site. Considering the fact that it was made in Russia in 1988. Kudos to you, sir. I love his expression as he plays. He knows he’s a complete badass for his work. That is the ESSENCE of geek! seriously that is so awesome! making absolutely everyone that feels just a little bit geeky today ashamed of their puny little *uinos – check indeed! The bitter truth is that such high skilled engineer in Russia is not a required profession. It’s something like amateur CNC and it very good for 1988. In Soviet Russia, Accordion plays YOU! Well, I do read russian (since I am russian) and I can say that there are unfortunately no build details at that link, so you didn’t miss a thing. But I can assist should you need any translation. And well, yeah, awesome work. So much reminds me of the goodies my grandfather used to make. It’s Accordion Hero, with a Russian reversal. @Necromant: What kind of goodies, for instance, sir? This man, is my new hero. Interesting… in the extended video at 17:47 there is a time/date imprint with the year 1997. The computer certainly looks like it’s from 1988 though. He’s just a rack,a pneumatic cylinder and a proportional valve away from it playing itself. But it is way cool just as it is. BTW check out the O’scope in the background and the homebrew keyboard. This is the kinda stuff that needs to be posted here daily!!!!!! And is that a 8 inch floppy on the top shelf? The epitome of style is to know how to play the accordion with great expertise but to choose not to. Credits to Vladimir for (not) playing the accordion so well! That’s exactly what I was thinking. One can tell by the way he operates the bellows that he certainly knows what he is doing. Either that or he had time to figure it out between ’88 and ’97; but I doubt that. All of the work put into this is mind blowing; Vladimir is a genius. @ledtester: The video is definately from around 1997 (there’s PC with tray load CD ROM at the bottom left of the still image, even.) I highly doubt he’d have a video camera then, considering he had to build his own computer and keyboard in 1988. In the capitalist side of the world, you’d have this kind of thing hooked up to a consumer microcomputer at that time. Very impressive hack! Where’d he get the solenoids? I still use his homemade lab power supply he gave me, that can drive dc from 0 to 100V up to two amps at 4 separate channels, a stereo amp of his design (He used some unknown to me soviet military transistors. Even he doesn’t remember where he got the specs and the parts – works like a charm, although I never adjust it to the max – just blows the speakers I used. I also have a couple of smaller lab power supplies of his design. Now when he’s over 80 he put the soldering iron away – a bit hard for him now. Btw. He’s the only one I know, who tests 220 and 380 volts ac with bare fingers (But never does it straight after dinner). LOL – so cool. Kudos to Vladimir for his pioneering spirit. Thou shalt be my Hero! so at the start of the video i was totally thinking he was inputting the missile codes. First of all, he IS smiling. But he’s smiling in a humble manner. He also looks a little weary and tired — not surprising, considering the time the picture has obviously been taken (about 1997) and the economic situation in Russia at the time. The guy probably had to work real hard just to make the ends meet! Now, can you imagine how much trouble it may have been to find all the components for his creation in 1988 in USSR? More builds should make use of 8″ floppy drives. This is excessively cool! And are those keys on the computer made of plywood? At first blush, the monitor looks like it could be a repurposed from an Agat (Apple ][ clone)… waste not, want not. But, I think that’s probably the only major Agat component. Otherwise, he’d have also been reusing the case, keyboard, and 5.25″ drive. Knowing old Soviet stuff it’s probably still 100% functional too. You find one in every Tetris cabinet. @tom61: Says in the Youtube comments he wound the solenoids himself. With a coil winding machine this number shouldn’t take too long, but making all those formers and the plungers with the buttons on the end must have been dull work. Also, the computer is a Specialist. Soviet 8080 clone based and runs a CPM knock-off. Made from plans in a magazine article from the mid-80s apparently. homecomputer.de tells me there was a commercial version called a Lik. Look at the other videos. In youtube.com/?v=0TTXVMMWlbU he is opening(?) that floppy drive. @horse, i thought it was the guy from COD modern warefare? Hard to refute the 1997 time stamp in the video, but I’m willing to take them fr there word that this was created a decade earlier on, and still uses the computer equipment shown. the decade that passes explains the acquisition of the newer computer equipment seen. My guess is that wierd Al is in the tag list because like weird Al (before Al gain some recognition). Vladimir ,wouldn’t come to mind if accordion pay was mentioned, both different in their own good way. It has a piano style keyboard. It has buttons instead of a piano style keyboard. @D_: As the author states he only had the equipment to create a video years after this Uberhack was done. since it seems the original hacker appears here …. could someone of the hackaday team have a interview with him. I would love to here about his CV and his hacking back in soviet times compared to today. @HaD team – is Vladimir still around? This would be sooooooo way cool to see him in the New York Times – can you arrange that? I wish we could put people in the new york times. I don’t know how we would arrange that. Holy heck, Vlad himself makes an appearance in the comments! The meaning is good or no? In this context, Hack is a good word meaning to modify something.